I stopped by Riverside park on my way to my karate class last night. I was swinging Maurice, my XP Deus metal detector, looking for the very deep stuff that other hunters have left in the ground. At one point I got a deep target that sounded good to me so I dug. This target was particularly deep and at the depth of 11 inches I finally got to feel the target with my fingers. I extracted a round object and for a moment I thought I had a large cent. Ha! keep dreaming! How cool is that!? I was standing approximately in the very same spot where a person stood back in the late 1870′ or early 1880’s (by the mid to late 1880’s, the area was already a city park) and got off three shots with his (or hers) shotgun. The drop happened within feet of the little Arkansas river. I imagine this person was hunting ducks. I picture the flock of ducks taking flight after being surprised by this hunter and then bam! bam! bam! three fatal shots and dinner soon after. I’ve seen a picture of Wichita at the time of its incorporation; 1870. There was barely a hint of a town there. By the early 1880’s however, the city had paved streets, brick buildings, banks, commerce, and two or three city parks. Very cool. I dug up a moment in time. Two hunters, 140 years apart, connected by three shot shells. I like it. I stopped at a small grassy spot in downtown Wichita after work. I’ve had very unproductive hunts on the last week and I wanted to hunt a small spot that I could cover completely in a short amount of time. I managed to find a 1965 Roosevelt dime at about five inches down plus other various and sundry items. The most significant of those was the shot shell. 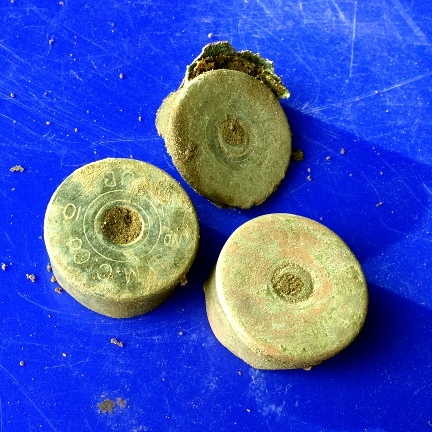 Normally I don’t get excited about shot shells but they do a lot to date an area. This one is a Winchester Repeater #12. According to Cartridge Corner (see link under Useful Links section on the right), this shotgun shell was made prior to 1901. I know it must have been dropped soon after it was made because there were houses on this spot very early on Wichita’s history. The dog tag was one inch down and the big chunk of lead was seven inches in the ground. The Lincoln Memorial cents were all between one to three inches deep. And I think I understand why I often feel that my short hunts are more productive than my long hunts. I believe it all has to do with expectations. 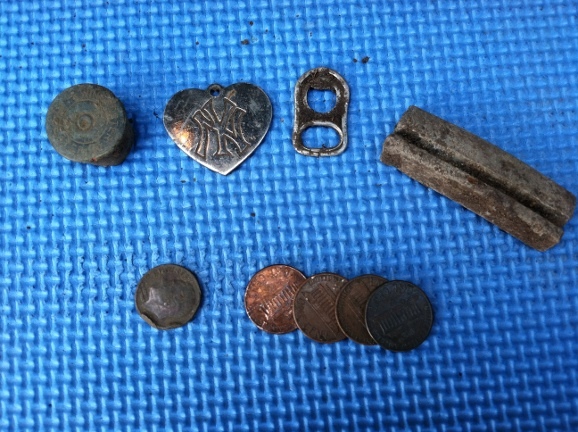 I don’t expect to find much on a 30 minute hunt so everything I find seems significant. On a long hunt, I expect to hit silver and gold and I am often disappointed. I am hoping this weekend I do better.